The website http://www.notreble.com has released an interesting interview with Warwick endorser Jeroen Paul Theseling which can be found below or on http://www.notreble.com/buzz/2011/11/17/ultra-low-an-interview-with-jeroen-paul-thesseling/. 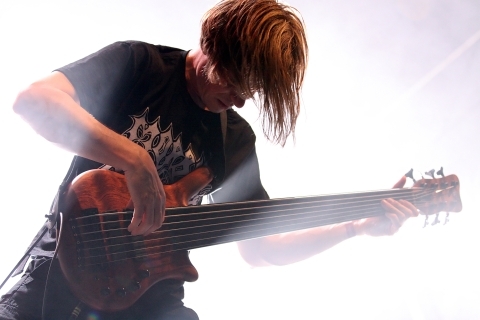 Jeroen Paul Thesseling is a bassist constantly pushing himself to new heights. The Amsterdam native picked up his first 4-string bass in his teens, eventually going on to study at the Conservatory at Enschede in the Netherlands. Though his studies were varied, his love for heavy music prevailed as he started his career with the death metal band Pestilence. After their breakup, the bassist took to world music and had touring stints with flamenco and fusion bands. His interests also led him to dive into micro-tonality, eventually developing his own 72-tone equal temperament bass. Thesseling came back to the metal scene in 2007 by joining German death metal outfit Obscura and subsequently rejoining Pestilence. The latter’s newest album gave him the idea for his new 7-string fretless Warwick Thumb NT, tuned from thunderously low F# up to a high C.
We caught up with Thesseling to get his story, and his thoughts on styles, music education and extended range basses. Two 3-Way toggle switches for coil selection: up position = serial, middle position = single coil, down position = parallel. How did you get your start playing bass? Well, actually I started playing violin at the age of six. It was more like a classical background that I built from that, playing famous classical pieces by Vivaldi and so on. I was very into baroque music and I also ended up in orchestras and a baroque ensemble. But – I think around the age of 14 – I switched to bass guitar. When I got into high school, my friends and colleagues were in bands and violin wasn’t that cool anymore [laughs]. In the end I switched completely, just dropping the violin. I started with a fretted, short-scale, cheap bass guitar. [It was a] four-string, of course. I think after half a year I auditioned for preparatory training at the Conservatory. I started in a one-year preparatory training course and then followed through to the main course for teaching. It was mostly a jazz education. You learn to play jazz standards, walking bass, and of course a lot of theory. That’s how I started with bass guitar, but I must say that when I got into the Conservatory, I was very much into rock and metal music. I liked jazz, but I was also very focused on completely different styles that they definitely didn’t teach at that time. You’re known as a metal player, but you’ve also spent a lot of time studying world music and playing with Flamenco groups. How do you see yourself as a player, and how do you split your time among genres. That’s a good question. I think I don’t see myself as a metal bassist at all… It’s just that I love some styles in metal – I like to play them and I like to listen to them. But besides that, there are many, many, many other styles of music [that I like]. I love jazz, I love fusion, I love world music, Arabic music, Persian music… So that’s a very broad interest. I’ve never limited myself by putting myself in a cube and saying, “Okay, this is the style you have to play.” I think I’m just too curious about how bass works in other styles. That moves you through different [musical] stages. Starting in Pestilence and releasing the first album I recorded, it was a big thing for me at that time. They gave me carte blanche. I could arrange my own bass lines and record them on that album. It was very experimental, like a mix of fusion and metal. I can say that that moment of my musical career had a huge influence on the rest of my musical development. After being in Pestilence, I got myself into micro-tonality, experimenting a lot with different scales in music. I also read lots and studied a lot of theory. But in the end, you’re hooked up with all kind of fretboards and it’s a very small, specific street [that you’re locked into]. It’s also very limited in the way that it’s not so easy to play with other musicians, because mostly they play with 12 tones. That made me move to fretless bass. Which is, of course, pretty uncommon in metal. Yes. The combination with fusion of course was maybe something that motivated me in that direction, but it was also being curious about not being bound anymore to those 40 frets on a fingerboard. If you’ve been busy with micro-tonality for years, you develop your ears in a different way. I just wanted to have freedom. I started playing flamenco with Arabic influences, and I think that was another important period of my studies. How have you been putting micro-tonality into use? Did you compose using it? Obviously, most people you’re playing with aren’t doing the same kind of thing. I saw it simply as pure study material. I made some recordings I still have somewhere, but it was more for developing a system of tuning that made me able to play all kinds of scales and do experiments with that, like playing chords on that bass. That was very interesting, but I also wanted to get involved in ensembles and performing. If you come with a 72-tone octave bass, you’re not going to make it in a rock band [laughs]. It started with world music and the micro-tone thing, doing tours with a Flamenco group. Then, slowly, I got back into metal again. I think it was 2007 when I joined Obscura, a death metal band from Germany. They already played pretty advanced technical music. They changed 75% of the lineup and it became more like a successful team. We recorded the first album and the response was really good. Then everything went really fast in the metal scene again. A few months ago it was announced you left Obscura. What happened? That was a very hard decision for me, but I had to leave the band. Four people trying to make a living off that band means you have to tour a lot. If you do nothing besides the band, you have to tour for 7-8 months per year just to make a living of it. That was something that I tried. I left my job and I went for it. During the period that I was active with Obscura, I also rejoined Pestilence again for several reasons, but also to make money to survive. Then you find out that it’s extremely hard to combine two bands, not only for recordings, but more for touring. You get huge problems and conflicting schedules. Earlier this year Pestilence released Doctrine, which led you to get your new bass. We were recording in Germany and we had a concept in mind. We were doing a tour of the U.S. when we had a great idea about how the album should be, with the guys playing 8-string guitars. We thought, “How cool would it be to have the guitars really low (tuned to an F#) and at the same time have the bass in the higher registers?” It would be also supporting now and then, but more coming up with bass arrangements that are in higher registers. We thought that that would work out very well, but honestly we got into the studio and were puzzled for a few days. It sounded very strange. I guess it’s something psychological – if you hear really low guitars, you expect the bass to be even lower than that. It’s just weird. Even if the sound is super fat, it makes it seem very thin in the mix. We’re used to the fact that bass is always lower, and it was a problem because we had to figure out what to do. I called Warwick and they sent me a low F# string and I retuned my 6-string fretless bass so we could record the lower parts that were needed. Of course, because of those recordings Warwick was asking me, “What are you going to do now? Will you keep that tuning on a 6-string?” I told them no, I wanted a 7-string bass. Then [Warwick owner] Hans-Peter Wilfer emailed me and said “Send me all the specs and all your wishes, and I’ll make sure you get that bass.” That’s how it started. We figured out a little bit about the electronics because I wanted to have good articulation. It’s very important of course in fusion and metal to have a bass sound that penetrates through the guitar sound. We have a special configuration on the pickups and the EQ. This is how we actually step by step built that bass. Speaking of articulation, you’re reaching down to an F#. Does it take anything special to make the notes speak? Are those note “felt” more than heard? That depends on the technicians, and it depends where you play. If you’re talking about a studio job, if you record music, it works great. It’s only that you need to find a good method to put the bass in the mix. Of course, you can’t just crank up the bass super loud. We used a few channels recording the album: For the mid-highs I used stereo channels, and for the lower frequencies, like the really brutal low sounds, I used a mono channel without any effects. That means that you can mix these channels, and say “In this part I want more volume in the low, and we can reduce the high-mids.” But in some parts it’s great that the high-mids scream out. That’s why it was so important to make sure the electronics were able to produce that sound for live performances. I admit, you have to get used to this instrument because the neck is broader and it’s heavier. It’s even heavier than the regular 6-string neck-thru Thumb. It’s quite a job to handle the instrument but it’s worth it. With extended-range basses, we’ve found that people either love them or they hate them, with no in between. What would you say to someone who says you don’t need seven strings? I can definitely imagine someone saying that because, let’s be honest, we have amazing music made by amazing bass players simply with a 4-string fretted bass. I think every bassist agrees on that, so it’s not about that. If you want to do things like this ultra-low stuff, that’s a choice, but it also brings a lot of things that you have to solve, like performing live. You need an extremely good sound engineer to make sure it comes out well in the mix. The low F# is probably around 20 or 22 Hertz or something, but it’s not [just] air… You can definitely tell which note you play. It’s audible. It’s only the circumstances need to also be good to have a very good sound in the audience. Coming back to the question though, it depends on what kind of music you want to play. Let’s be clear here: I’m not using higher strings. To be honest, I know I’ll never play on a 9-string bass with higher strings than a C. I don’t need [strings higher than C], so I’ll never use a 7-string bass with a higher string above the C. Never. I don’t have any reasons to do that for the music that I play. The reason was that I needed to go lower. The funny thing is that even if you don’t play Pestilence songs but you want to play a walking bass line or fusion music, it’s awesome to make bass arrangements with the ultra-low tones sometimes. I’m not playing mainly on that string because it would be ridiculous. It’s more like having a wider spectrum while the B,E,A,D, and G strings are the most played. That’s the core of the bass and that’s the main thing that you play, but you create a lot of dynamics by also using these extremely low tones in a bass line. It’s beautiful. That’s also my main reason without playing Pestilence material, I’m busy with a new project now and I want to use this bass for everything. It’s beautiful to have so many dynamics in bass arrangements. It’s a challenge. So it’s really about options. Definitely, and I think that seven string basses with low strings with tunings like this one, they might become more popular in time. You see the trend in guitars. First you had 7-string guitars, now you see 8-string guitars, used in a lot of metal music of course. I think it’s a matter of time and more and more bassists are going to experiment with these instruments. The new project was actually set up with an Italian guitarist, Tommy Talamanca. He’s from the band Sadist, from Italy. I’ve been living in the neighborhood of Genoa for a while, and we’re friends. After leaving Obscura, I thought “What could I do?” Honestly, I’m 40 years old now, and I don’t feel like touring anymore. Being five or six weeks on the road in a bus, every night playing the same songs. It was great to do it, but on the other hand I must say you don’t get to develop yourself to become a better musician because you’re always playing the same stuff every night, over and over again. I really like the idea of developing myself in projects. This is the perfect setup to continue with music and work with great musicians, but to do it in a different form than touring. So then we thought we both have a background in progressive death metal, but we thought maybe it’s also nice to include fusion influences in metal. It gets into very fusion-y technical stuff, but of course we try to make very good songs. The structure shouldn’t be too complex, but really challenging music. When will we be hearing from that? We are almost done with completing the lineup, and we’re about to announce it in a few days. It’s definitely going to be an international project. Thank God it’s all in Europe, but we’re all from different countries. The consequence is you have to work at a distance and send each other files, work on drafts and mixes. Then we will eventually come together in Genoa and record an album. That’s the plan. What advice do you have for up and coming bassists, and how important do you think it is for bassists to study in a school environment now? I think it’s very important to study, because in the end you develop certain things and knowledge of how music was played and theoretical aspects of it. It makes you grow as a musician. I’m not saying that you would always need that, but it’s like a general development that very very helpful for the rest of a musical career. On the other hand, my situation was that Pestilence was touring while I was in school, discussing with my teacher which music style would be more interesting – metal or jazz [laughs]. However, if you finish school though, that doesn’t say anything. You’ll have a conservatory paper, and you can say “I’m a teaching musician now.” That’s nice but coming out of school is when it all starts. In my opinion, you have to develop your own language, your own way of expression on an instrument and that takes time. It’s something that can take 15 years before you say “I’m in a direction that I wanted to be,” but as a musician and an artist, you should never be satisfied. You always have to develop and work on yourself. To find out more about Jeroen Paul Thesseling and hear his music, visit his website at www.jeroenthesseling.com.